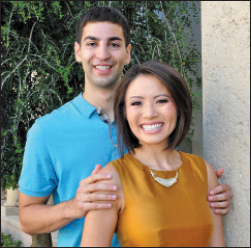 When local WTSP/CBS news anchor Dion Lim first arrived in town with her husband, Evan Panesis, she had found corporate housing in Tampa’s Hyde Park neighborhood. Unluckily for them, they moved in during Gasparilla weekend and experienced the revelry firsthand (perhaps more firsthand than even a news anchor would desire). A few months later, in search of a permanent residence, Dion and Evan began exploring neighborhoods on both sides of the Bay. When they discovered the Old Northeast, they were instantly hooked. 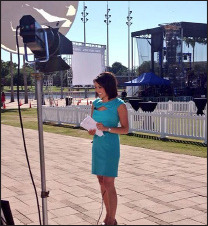 Though Dion may be a fresh face in Tampa Bay news, she has achieved an impressive career trajectory in broadcasting. She began in Boston, where she and Evan first met, and moved to news stations in Kansas City and Charlotte along the way. Dion was raised by very frugal parents and embraced the value of frugality early on in her career, as chronicled in her blog, Life During the Commercial Break. A strong work ethic, a healthy dose of humility, always staying grounded and focused, and embracing the joy of her work have all contributed to Dion’s success and her natural charm as a person. Her most recent promotion as an anchor for the 5pm, 6pm, and 11pm CBS Channel 10 News could not have come to a more deserving candidate. Their enjoyment of career balance and their new life in Florida is certainly indicative of hard work paying off. They have both displayed a fierce work ethic and sense of discipline in their respective careers – as well as a well-rounded perspective on the world and their industries. Evan demurs about young people following in his career path. “Poker increasingly gets tougher even though everyone thinks it’s easy. 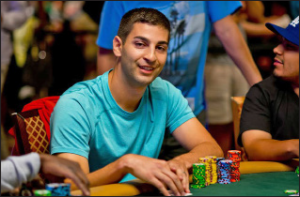 It’s hard to break in with so many amazing players at the top trying to beat each other.” Evan has coached people in the past, but he recommends that adopting poker as a career should be approached with care – and not as a first choice. However, one perk of such a career is Evan’s ability to work virtually anywhere, though he has enjoyed being in St. Petersburg in particular, as it is close to professional poker tournaments all over the state. A second benefit is the ability to match his work hours with Dion’s, which enables the couple to spend more time together and enjoy the new city they call home. “We like the adventure of moving around,” Evan says, “but we’d really like to settle here.” Dion concurs. Whatever may come next, they both share dreams of being a part of our Old Northeast community for the long haul, becoming fixtures in this slice of paradise. To visit Dion’s blog, visit lifeduringthecommercialbreak.com. For her fan page, go to www.facebook.com/pages/Dion-Lim/146674682074805.